Wet tops of margarita glasses, and then dip in salt. 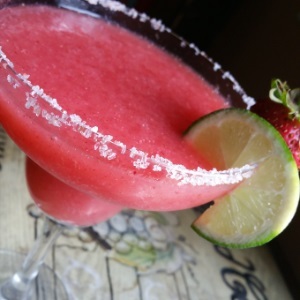 Add strawberries, tequila, lime juice, orange juice, and Strawberry White Balsamic Vinegar in a blender. Blend until smooth, adding ice towards the end. Pour the mixture into glasses and enjoy! Feel free to get creative…I have also made these margaritas with our Raspberry White, and Mango White Riserva Balsamics…equally delicious!